Don't mistake it for a school bus - that big yellow vehicle is much more than just that. Take a peek inside it next time it comes by your neighbourhood. Maybe you'll be surprised. A bearded man guards the entrance to this tiny chamber of secrets. Behind him are rows upon rows of books. Fat, small, new or ancient - take your pick. The man at the tiny table counter tells us that they all have their loyal readers. 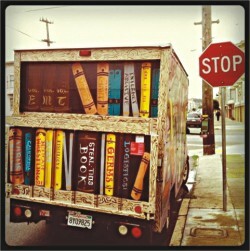 Would you believe that this little library on wheels actually has over ten thousand members? Most of them are kids, he says. And we breathe a sigh of relief. They may have their iPods and gaming consoles, but at least they haven't forgotten how to read. A collection of Ahsan Habibs and Zafar Iqbals lie on one of the lower shelves, in good reach of eager little hands. Looking down from the upper shelves is a selection of Rabindranath and Nazrul's works, enticing us with the promise of new and magical lands. All the books look like they're well-cared for. No dog-eared pages, no scribbles at the margins. The Bhrammoman Pathagar, or the Mobile Library, has been successfully run by the Bissho Shahitto Kendro for quite a number of years now. Seeing a steady and growing number of readers, the library has expanded its selection of books. Now, it boasts of a couple of thousand books on its five narrow shelves. They have reference books, children's books, and more. But it's the latest novels that have always been the most popular. What appears to be one bus is actually a fleet of five buses, all carrying similar books and resources. They go all around Dhaka, stopping at more than two hundred locations around the city. They stop at each point once a week, and from Puran Dhaka to Motijheel, you'll always find a busy swarm of book lovers around it. Hasan, a student, has been a member of the library for about six months. “The Library doesn't always reach on time, but they try their best,” he says. “But we all understand. With the traffic condition being so bad, it's not always possible for them to stick to the schedule.” Sometimes he has to wait for the Library to arrive. Other days a quick phone call will tell him how long it will take them to reach him. Becoming a member is both cheap and easy. The membership fee is Tk. 160 if you want to be a regular member and only Tk. 200 if you want to be a special member. You can borrow one book at a time, and can keep it up to a week, or the next time that the Library comes around. With a nominal contribution of Tk. 10, just about anybody can hop aboard. Give them a call at 9660812 or 8618567, or email them at kendro@bangla.net to know when they're coming round to your place next. A perfect mix of quaint and modern, the Mobile Library comes as a much-needed chance to indulge in the simple pleasure of reading. The Lifebuoy Friendship Hospital: Providing healthcare to the remote char regions of the country, this boat-hospital becomes even more important during the rainy monsoon season. Solar Panel Boat School: Also going about the char areas, this boat school even has computers aboard and what's more, they all run on solar power! We just wish our schools were as awesome as this. Igloo mamas: They have ice cream. They are cool. Your eyes spring open and you stare into the wide darkness in front of you. Checking your mobile phone, you are not surprised that you have woken up at 3am. Again. You turn onto your side just when the air conditioner has turned off obediently to its pre-set timer, leaving you surrounded in complete silence; a silence which is deafening enough to haunt your ears. Irritated, you change sides again and you feel a tingly sensation on the back of your neck. You force your eyes to close and burrow yourself further inside your blanket but you can't stay this way for long. You decide to get up from your bed and get yourself a glass of water, you are dehydrated. The wind from the fan blows up your curtains which allow you small glimpses of the shadowy portrait outside painted by the motionless trees faintly illuminated by a lopsided moon in the night sky. As you open your door, you hear a bark and a howl and you assume that the neighbourhood dogs have gotten themselves into a fight again. You carefully lay your footsteps on the floor as if to wake no one but once you realize that a light switch is near, you run to it and light up the dining room, half expecting that someone is watching you and half knowing that you are alone. Upon returning back to your bed, you hear a cry outside and you wonder if it's a baby or just a cat. You try thinking of happy thoughts in hopes of relieving yourself off this paranoia but your thoughts are blocked by the sound of heavy foot steps coming from the floor above. Who walks like that at this hour? Wait, did you just see a shadow pass? No, it's just your imagination so you cling tight onto your pillow and start praying to fall back asleep. It's still the hour of 3 in the morning and this is The Devil's Hour. This is when the sound of your own heartbeat reminds you of your worst nightmares. This is when your worst thoughts resurface to torment your sleep. This is when the demons take over, meddling with your entire existence. This is when you are the toy for the ghouls who play with your soul. This is when most people die. But apart from the urban legends that this so called Devil's Hour claims, you need not be scared about anything but your health. 3am onwards, or during dawn, is when your immune system is at its low which is why so many people tend to die at this hour. People are more likely to survive car crashes during the day rather than early in the morning or late at night (yes we expect you to ignore the fact that there aren't many people on the road to come to rescue at dawn). If you are a normal person, the low in your immune system will not even be noticeable, maybe some unreasonable mood swings may occur but nothing more than that. 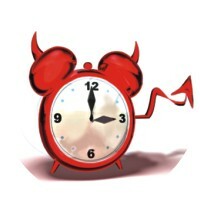 So yes, the legend of The Devil's Hour is utter balderdash. Or is it? Ever wanted a website where you could chill with fellow Bangladeshi football fans, read their opinions and views on different football incidents and events, keep up to date with football news around the world, all from a Bangladeshi website? Then www.plaantik.com is what you are looking for. The website was formed by Majed ul Huq, Aarony Zade, Abir Ahmed Chowdhury and Tawsif B. Akkas and is powered by UFA (Underground Football Association). In a pretty short time, the website gained much popularity and support from football fans both local and foreign. The Plaantik crew has recently been congratulated by John Dikes and Andrew Lecy from EPSN for their initiative and efforts, which, any who follow football will know, is a pretty big deal. Fashioned after different popular football news sites like Goal.com, Caughtoffside.com, the name Plaantik is slang for penalty kick. The non-English speaking football fans of the country mostly mispronounce penalty kick as plaantik. Fun fact. Currently, Plaantik features 5-6 regular writers, with news of both local and international football along with the writer's views and takes on teams, matches, seasons, etc, and detailed football analysis. Local football includes both professional and non-professional (also known as underground football) leagues and tourneys. The webpage looks nice and is pleasing on the eyes. The Plaantik logo on top of the page looks particularly cool. The website is easily navigable and promises of greater and grander things. “We're planning on integrating online games into the website. Like fantasy football, for instance, or Predictor. And Plaantik Shootouts,” Majed added, chuckling. All in all, the website looks promising. The crew is certainly ambitious, aiming for the sky. However, Plaantik could use more writers. Anyone could write for the site, but it's not easy to find enthusiastic people who know enough about the game and can write well. The number of articles in the site was somewhat disappointing. Funds for the site are also pretty limited. The webpage currently runs on revenue generated by UFA. It would be a shame if the website doesn't survive due to money troubles. We football fans wish Plaantik all the best for the future and hope it realises its visions. Also, anyone who wants to write for Plaantik can send in their write-ups to plaantik@gmail.com. You can visit their facebook page at www.facebook.com/plaantik.